4.12. What If You Can’t Push? We will use a version control system to track your work, and allow the instructor to give feedback. Odds are, this will be the same exact system you’d use in a large company. Open “git bash” on Windows, or “terminal” on MacOS. Type cd mydirectoryname where the name of the directory will be the same as the name of your repository on BitBucket. You can usually type in the first few letters and hit <tab> to fill in the rest of the directory name. Type git commit -m "Work on lab 1" Update the comment between the quotes to whatever you did. If you get an error while pushing, see What If You Can’t Push? Paste link, and turn in. For more commands, see the Longer Git Command Reference. No serious development should be done without version control. In fact, version control is so important, many developers would argue that almost no development should be done without version control. Even all my notes for class I keep in version control. Get any prior version of a project. Released version 1.5 of your program, and now it is crashing? Quick! Go back to version 1.4. Did the ‘new guy’ mess up the project? Revert back! Know exactly what changed in the code, when, and by who. See who is actually doing the work. If a mistake gets added in, see when it was added and by whom. Easily share code between developers. Easily work independently of other developers. Recover an accidentally deleted or overwritten file. Go back and create a bug-fix release on prior versions of a program. Work on multiple computers and keep files in sync. Version control saves untold time and headaches. It used to be that version control had enough of a learning curve that some developers refused to use it. Thankfully today’s version control tools are so easy to use there’s no excuse not to. There are two main types of version control. The original version control systems were “centralized.” Subversion (SVN) is a very popular piece of software that supports this type of version control. The other type is a “Distributed Version Control Systems” (DVCS). There are two popular versions of DVCS in use today, Git and Mercurial. Mercurial is sometimes also known as Hg. Get it? Hg is the symbol for Mercury. Either Git or Hg works fine, but for this tutorial we will standardize on Git. Let’s install git on your computer. If you are using a school computer with git pre-installed, you can skip this step. Click the link below and download and install the 64-bit version of the git. You should only have to fork the code once during class. If you do it more than once, something is wrong. Stop before you do this and see the instructor. It is a big headache for everyone if you fork more than once. Next, select a name for your fork. Use your last name and first name. Also, select that your repository is private, so that you don’t share your homework answers with the world. Now you have your own fork. It exists on the BitBucket server only. Give read permission to the instructor pcraven for your fork so he can grade your assignments. Check the feedback on your homework. If the instructor can’t get to your homework, you’ll get a zero. You need to correct this and resubmit ASAP. Run the program “Git Bash” on Windows. Or, if you are on the mac, go under “Applications”, find “Utilities” and in that run “Terminal”. Figure out where you want to store your files. You might want to store the files on your laptop, a flash drive, or a networked drive. Figure out what directory your “Bash” window is in. Do this by typing pwd, which is short for “print working directory”. You can see what files are in the directory by typing ls, short for “list files”. cd Change to your “home” directory. cd mydir Change to mydir directory. That directory must be in the same directory you are in now. Also, if you don’t want to type the full directory name, you can type the first few letters and hit <tab>. cd .. Go up one directory. There you go! You now have a directory set up where you can do your work. 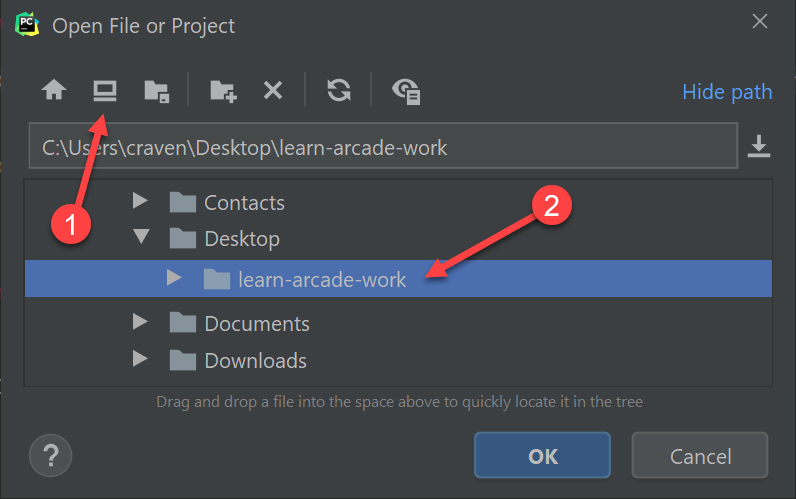 Go ahead and start PyCharm, then select “File…Open” and select that directory. Your project should look like the image below. If this isn’t what you have, you might have opened the wrong folder. Hit “File…Open” and try again. 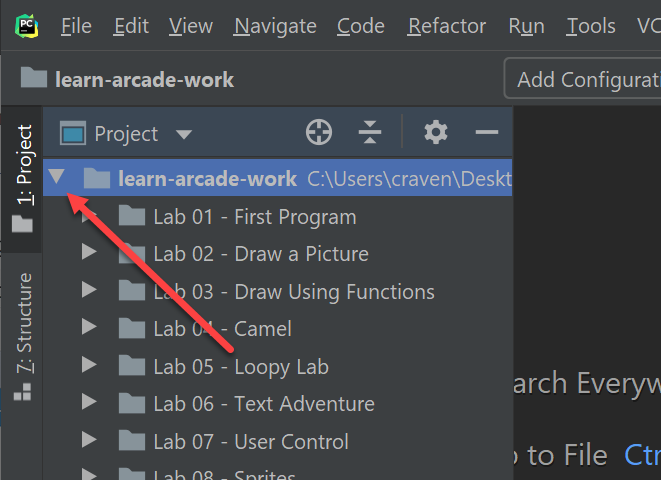 If you click the arrow next to the folder name, you can see all the folders in the project folder. 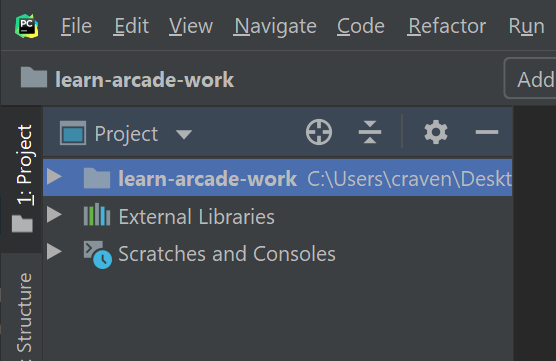 If you move from computer to computer hand have a flash drive, you can reopen your project be just doing “File…Open”. If you don’t have your flash drive, you’ll need to re-clone your repository. Let’s practice making a quick change to one of our files. 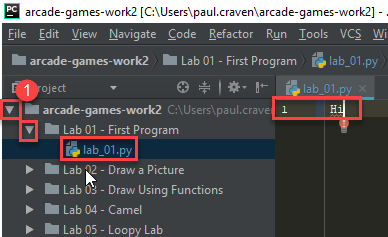 Open your project folder, open the lab 1 folder, then open lab one. Type in “Hi” or something similar. It is time to commit. Wait! You are young and don’t want to commit yet? The cool thing with version control, is that every time you commit, you can go back to the code at that point in time. Version control lets you take it all back! It is the best type of commitment ever! Now, add all the files that have changed. The asterisk (*) is a wild card character that means get all changes. Optionally, we could list out each file, but that’s a lot of work and we don’t want to leave anything behind anyway. $ git commit -m "Work on lab 1"
git config --global user.email "put.your.email.here@my.simpson.edu"
Then you can re-run your commit command. You can use the “up” arrow to get commands you typed in previously so you don’t need to retype anything. Writing objects: 100% (4/4), 329 bytes | 0 bytes/s, done. Look to see if the message says that there is an “error.” The message will probably look a little different than what you see above, with other objects or threads, but there should not be any errors. If there are errors, skip down to What If You Can’t Push?. Now go to Scholar and paste the link into the text field for the lab you are are working on. If you do hove code to commit, jump up to Commit Your Code and then come back here. Normally, this will work fine and you’ll be done. But if you have other computers that you are coding on, the computer will automatically try to merge. If you get a screen like the image below, the computer automatically merged your code bases. 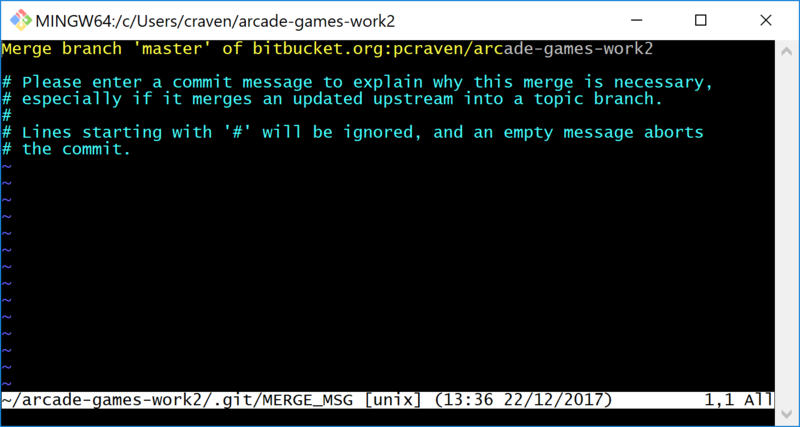 It now wants you to type in a comment for the merge. We’ll take the default comment. Hold down the shift key and type ZZ. If that doesn’t work, hit escape, and then try again. Then we edited the same file in the same spot. We have to tell the computer if we want our changes, or the changes on the other computer. The key thing to look for is any file that says both modified. $ git checkout --ours "Lab 01 - First Program/lab_01.py"
$ git checkout --theirs "Lab 01 - First Program/lab_01.py"
Writing objects: 100% (5/5), 531 bytes | 0 bytes/s, done. In my experience with 300 level group-project classes, these commands seem to capture most of what students need to do. git checkout -- . Remove all your changes, go back to what was last committed. Untracked files are kept. git checkout master Go back to most recent check in on the master branch. git commit -m "My message" Commit your work. Use a descriptive message or the other people in the class will be irritated with you. git push Push commit up to the server.